BeerViking: A week around Bamberg #6: When is a Vollbier actually a Dunkel? 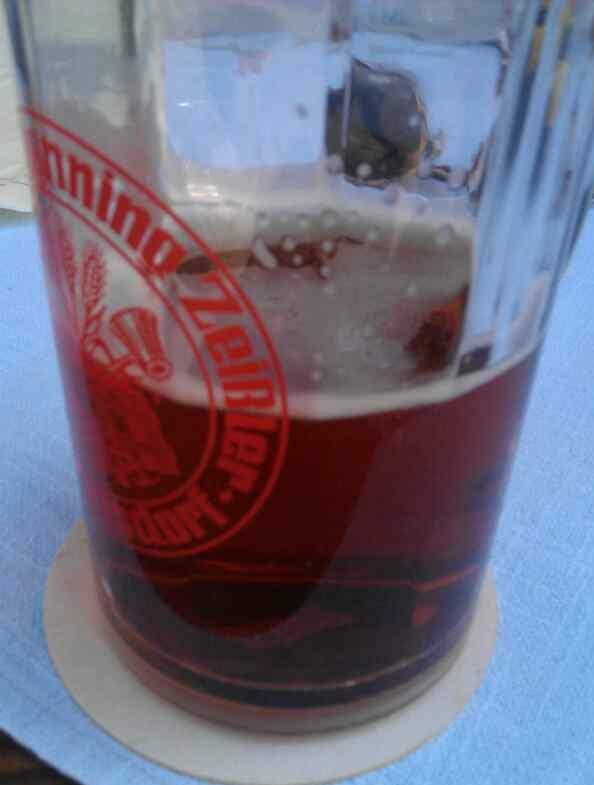 A week around Bamberg #6: When is a Vollbier actually a Dunkel? Part of the problem is terminology. In German, Vollbier ("full beer") is the taxation class for regular beers of around 3.5%-5.5%, but because for many breweries their Vollbier is an Export Helles or somesuch, some foreigners have assumed that Vollbier=Helles. Similarly, Dunkel just means dark. Ask for a draught Dunkel at Mahrs Bräu brewery tap, as I did, and you'll get not their ETA Hoffmann, which is more of a Munich Dunkel, but their Ungespundet. It's light brown but it's darker than Mahrs Hell or Weiss. Equally, Helles/Hell merely means pale and is not automatically a synonym for Dortmunder Export or Bavarian Helles. For many breweries, it is simply the one of their two regular beers that is not Dunkel. If you want to refer to a beer style, you probably need to add that extra qualifier. I've enjoyed reading your postings about Bamberg. We spent a day, plus a late afternoon, there last month, whilst visiting Franconia for Annafest. Spent a week in the city three years ago, and loved every minute of it. The find for us, this time round, was Cafe Abseits. Well worth a visit, even if it is on the other side of the tracks! It serves a wide range (for Germany), of beers that are difficult to obtain elsewhere, and also stocks bottles from the pilot brewery at the nearby Weyermann maltings. Thanks Paul, I did want to go to Cafe Abseits but there were so many other places to get to - and as you say, it is a bit off the beaten track - that we never got around to it. Next time, I hope! I still need to write up Annafest - which days were you there? We nearly but not quite overlapped there with Ron Pattinson, who's been writing about many of the same places. We visited Annafest on three separate days, Brian - Tues 23rd; Thurs 25th and Sunday 28th July. In between we visited towns such as Bamberg, Coburg, and also had a day out in the Steigerwald area intending to visit the Kreuzberg Kellers, but only getting as far as Roppelts Keller. (I will be writing about this a bit later on). We based ourselves in Forchheim, a lovely little town with four breweries. We did find though that many of Forchheim's pubs and restaurants are closed for the duration of Annafest - it seems the staff are either working up on the Kellerwald, or having a good time there instead!